Where students have shown their talent and prudence through their mesmerizing paintings and hence proved" ART IS FOR EVERYONE ". 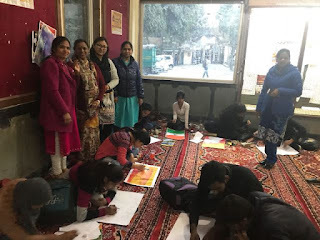 A few paintings depicted the childlike innocence of students , some got highlighted by the presence of mind whereas a few were exceptional indicating the style of an artistically professional person who is beyond at par of his/her age. So it was overwhelming to have to all as participants. Besides, A big thank to all the teachers present there for organising it real well.